Is that save/cancel reversal universal to Delicious in all extensions? I usually tab down to Save and hit enter, but I agree it is very annoying. Still, I find Delicious to be incredibly useful–haven’t really found anything else to replace or better it yet. I wouldn’t be surprised if they swapped the buttons to reduce the risk of people trying to click “Save” but clicking outside the extension instead. That kind of makes sense, but if so it’s an example of unsuccessfully using the UI layer to compensate for more fundamental problems (in this case, the fact that the extension loses user data when closed). You’re right about Delicious, nothing can replace it, and it’s pretty essential to me as well. If I didn’t use the extension very frequently, its little UI quirks wouldn’t annoy me so much! Yeah …. true! .. and the unfortunate thing is that NONE of the Chrome Delicious extensions come anywhere near the Delicious Add-On for Firefox .. IMHO… If only!! This glaring weakness with Chrome if forcing me back to Firefox, but I don’t want to go there. Well, maybe my ‘domestic blindness’ is preventing me from finding a suitable Delicious Extension for Chrome .. I dunno .. but all of the ones I can source are deficient in a number of annoying ways [alla ‘Why I Hate…”]. Unfortunately I am heavily dependent upon Delicious … Time for someone [Google???] to address this glaring hole, in the market and/or in Chrome. Well founded rumours suggest that Y! is shutting down Delicious … now that will certainly solve the ‘Chrome Delicious Extension’ dilemma!! Wow, that’s bad news! I hope their decision wasn’t influenced by my negative comments about the Chrome extension. If so… Yahoo, I didn’t mean it, I promise! So what happens next? Surely they’ve got to open source it, like Google did with Wave? Here … this looks like a good replacement for the ‘not so yummy any more’ delicious bookmark manager. Some good points. I’d add the lack of the tag suggestions, which I find such a HUGE time-saver in the Firefox version… this small thing in an extension really is dissuading me from adopting Chrome as my default browser. Crazy, but true! I’m not sure I follow your comment re: the order of Save & Cancel. Certainly on this PC (Windows XP), every diagloue box has the buttons in the order “OK, Cancel, Apply, Help”, which (to my mind) corresponds with the order of “Save, Cancel” in the Chrome extension. Can you cite your examples in which you see this behaviour? Regarding the closure of Delicious, is that still on the cards? This mention alarmed me enough to do a quick Google, but I didn’t find much evidence to substantiate the assertion that it’s an impending move. Perhaps the closure is no longer imminent…? BTW, if you have any sort of programmatic control over this blog, may I suggest you allow the “Notify me of following comments via e-mail” checkbox take focus after having tabbed twice from the comments textarea. I instinctively tabbed twice and hit Space, and was surprised by the results. Thanks! Agreed with Rfah’s statement that the Delicious extension for Chrome completely pales in comparison for the one on Firefox. 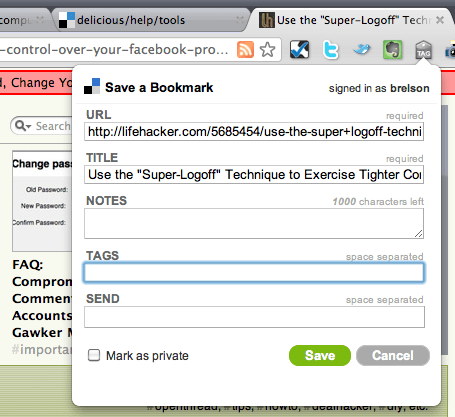 I like to go back and browse my bookmarks by tags, and I just can’t do that with Chrome. IMHO, the interface for Firefox’s implementation is so much cleaner and better, with the ability to bring up the sidebar with the listing of bookmarks.